As you might have guessed, here at Sir Jason Winters International, we love tea and are enthusiastic about getting others to experience the goodness that it has to offer. But did you know that tea can also be a fantastic cooking ingredient as well? Tea can add a depth and a unique dimension of flavor to a dish in ways that other ingredients can’t. Tea can be pre-brewed and used in place of water. It can be infused into chicken stock or added to marinades or used to steam, poach, or used as a key ingredient in stir-fried dishes. Tea leaves added to uncooked rice can be used to smoke as a flavor to meats and fish that are slow roasted in the oven or on the grill. Tea used as a cooking ingredient has even found its way onto programs hosted by celebrity chefs such as Martha Stewart, Steven Raichlen, and Ming Tsai. If you already love the taste of tea, this article will tell you how you can expand your use of it to create new culinary delights. Green tea especially is a wonderful cooking ingredient. When added atop soup or salad or added to a vinaigrette, it can add a unique taste to a meal. If you’re going to use it as a broth, the tea should be prepared in a different way that if you were drinking it. It needs to be much stronger so that the taste comes through the other ingredients. Use cool spring water and allow the loose tea or tea bags to steep for 20 – 30 minutes. An alternative is to add a teaspoon or two of green or black tea leaves to your soup and let it simmer with all the other ingredients. This will lend a rich, smooth flavor to the entire pot. Traditional healers and doctors in China recommend adding tea to soup to help reduce fat and help make them healthier. 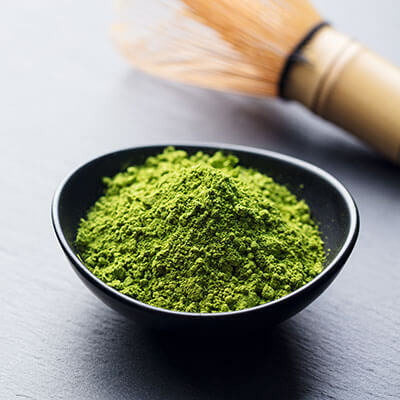 By adding powdered green tea, or matcha, to pasta dough, it the tea will create a gourmet flavor all its own. Tea leaves folded into room-temperature unsalted butter will create patterns in the butter and is delicious over vegetables, or spread over fresh baked bread or toast. Green tea added to uncooked corn kernels and jasmine rice make up the tea known as genmaicha. When added to a hot wok, both the rice and the tea become toasted and give a wonderful nutty taste that can enhance the flavor of meats and vegetables. Cook jasmine rice in an infusion of tea in place of water. To one cup of rice, add green tea that has been allowed to steep for 20 -25 minutes. Simmer until all liquid is absorbed. Fluff the rice and serve. Combine all of the ingredients thoroughly and keep stored in a glass jar. The mixture can be kept either refrigerated or at room temperature approximately two months. Salmon is a favorite main course dish Celebrity chef, Ming Tsai of Public Broadcasting’s Simply Ming suggests combining the following ingredients to create a marinade for a salmon steak weighing approximately 1 pound that has been divided into fourths. Combine the mirin, water, sugar, and salt. Add the ginger and toasted peppercorns. Place the salmon in a baking dish and cover with the marinade. Refrigerate in the marinade for 1 to 2 hours. Line a wok with foil then place the rice, sugar and tea mixture on medium heat. When the mixture begins to smoke or smolder, place in the wok over the top of the rice, sugar and tea mixture. Remove salmon from the marinade and inside the bamboo steamer. Reduce the heat to low and place wet cloths over the wok and steamer. The salmon should be allowed to steam under the wet cloths for 15 -25 minutes, depending on how well you prefer your salmon to be done. The host of Project Smoke, Steven Raichlen also uses tea in smoking meats. Raichlen’s recipe of Tea-Smoked Duck has appeared both on his website and the award-winning show. Thoroughly cover the duck with half of the rub. Take one tablespoon of sesame oil and rub it over the duck. Take the remaining rub and sprinkle over the duck and rub into the skin. Prick the skin of the duck all over with a fork to allow the rub and the juices seep into the meat during cooking. Use half of the smoking mixture in the meat smoker to a temperature of 300 degrees. Cook for approximately two hours. The meat should reach an internal temperature of 145 degrees. Then, increase the temperature of the smoker to 350 degrees; baste with a bit more sesame oil and some of the juices that have gathered in the drip pan that has been placed below the duck. Add the remaining smoking mixture and cook for an additional 1 to 1 ½ hour. The duck should have an internal temperature of 175 -180 degrees or until the skin is crisp and dark. Eat and enjoy the rich spicy and almost grassy flavor of the duck! These are just a few ideas on how using tea in cooking as an ingredient in a recipe. Try some and see how they turn out or leave us a comment if you have some additional delicious ideas!